Making 10 with multiple addends – let’s have some math fun! 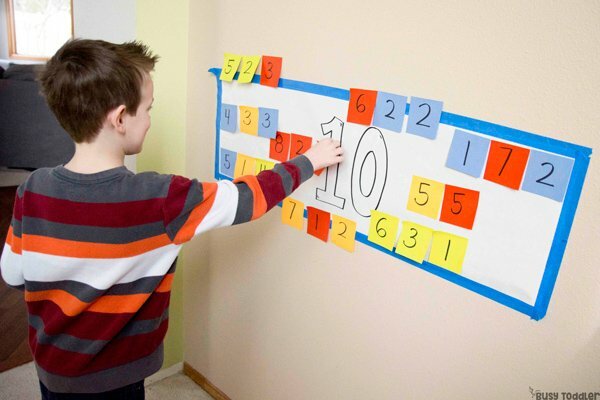 Memorizing math facts can be a daunting task. How can those little “weren’t you a baby yesterday?” heads remember all that information? But they can and they do and helping them with that rapid recall can actually be pretty fun. That’s how this Making 10 activity came to be. This activity focuses on finding ways to make 10 using multiple addends. If your child is working on using two addends, check out this post from Life Over C’s. A little disclaimer: this activity is working on “rapid recall” meaning a heavy focus in computational fluency (how’s that for a fancy phrase?). Your child MUST have first mastered the procedural fluency of addition (another big word) in order to be ready for this. What is procedural fluency? 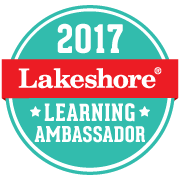 That’s the years of practice that come before an activity like this – years of learning the why behind addition and what addition means. We don’t want kids to memorize 7 + 3 is 10. We want them to understand that a group of 7 objects when combined with a group of 3 objects becomes a large group of 10 objects. So stop and work on PROCEDURAL fluency first. Then come back here for this computational (rapid recall, quickly solving) activity. 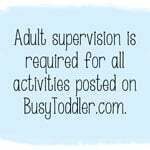 What’s the point of this activity? 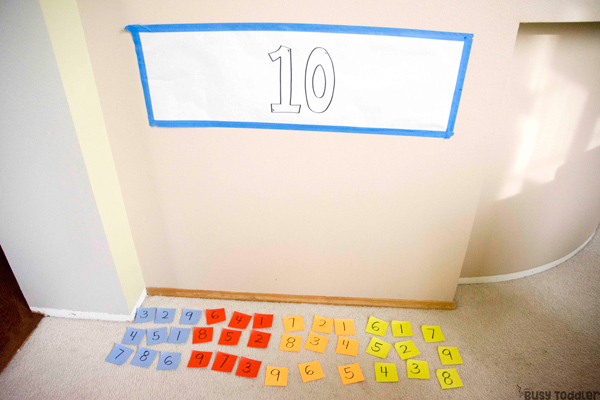 The point of this activity is to help a child find various ways to make 10. 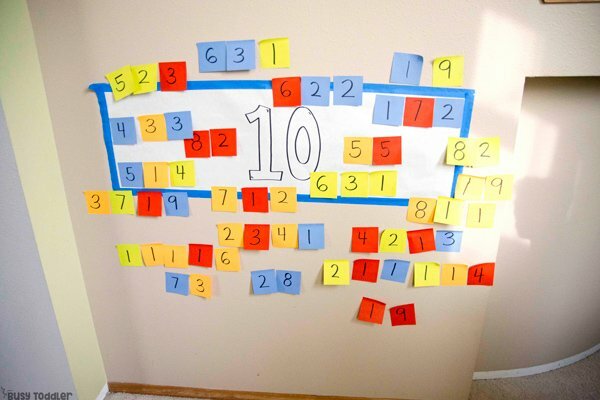 Our society using base-ten and it’s our job as parents and care givers to help kids understand the world of numbers in relation to 10. 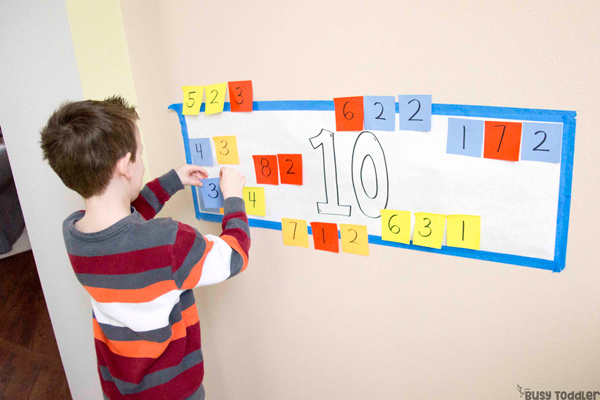 Often, when talking about 10 with kids, we stop at two addends (combining two numbers) even though there are multiple ways to make 10 with more than two numbers. 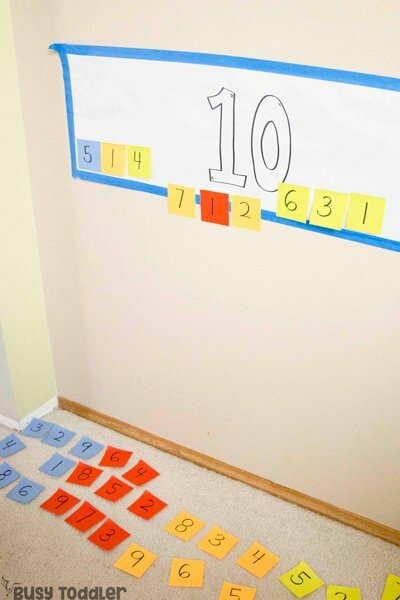 This is a pretty advanced concept for kids in early elementary school that numbers can be separated or created with multiple groups. I decided to make a giant number 10 on white butcher paper, but let me tell you: I significantly underestimated how much room we would need. We definitely needed more paper – next time, I’ll do two rows of white butcher paper to make a larger area to play with. 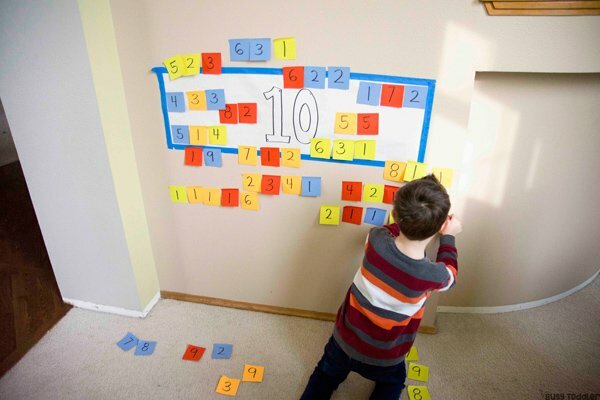 On my Post-It notes, I drew the numbers 1-9 over and over, but heavily focusing on the numbers 1-3 which I knew my son would need the most of. 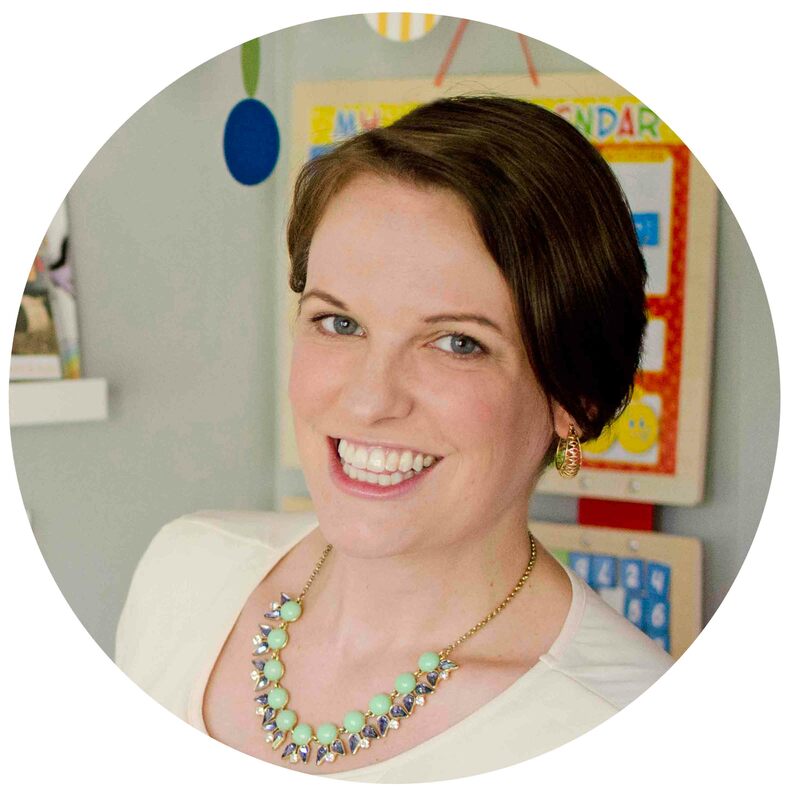 Whoa – did this list every grow! My son started with two number equations, 9 and 1, 7 and 3, 5 and 5. 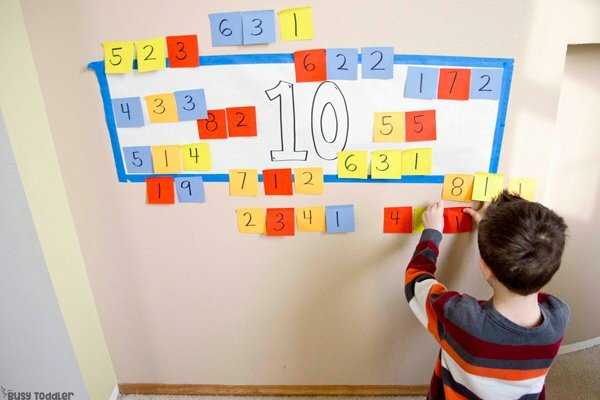 But quickly he began looking at numbers and noticing that if 5 and 5 is 10, then 2 and 3 + 2 and 3 is also 10. He kept separating numbers in his head to make more and more equations. We also talked about the commutative property of mathematics but not actually using that term quite yet. What we noticed was that 9 and 1 made 10 and 1 and 9 also made 10. The order didn’t change the outcome. This is a huge realization. Don’t rush your child into this until they have a strong procedural fluency and a good grip on all the whys in addition. Without that background knowledge providing them a firm base of understanding, they run the risk of memorizing without actually learning. 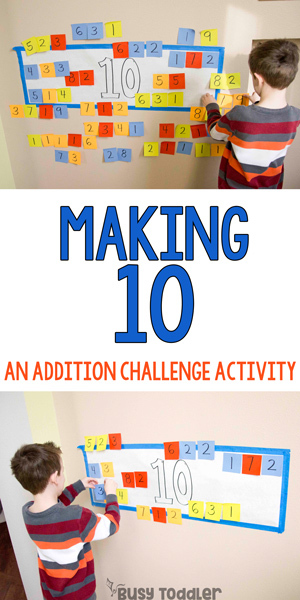 Man this activity took on a life of its own as my son found more and more ways to make 10. 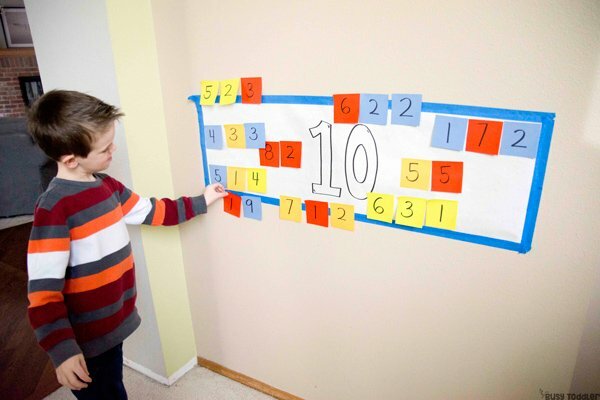 Even he was blown away by all the possible combinations of numbers that can add up to 10. 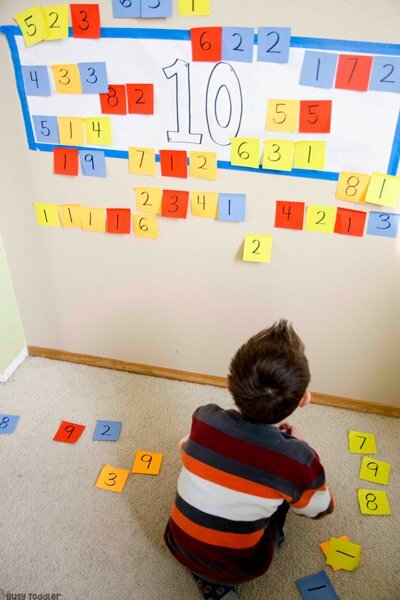 Understanding 10 is a huge step in math and one that we can’t afford to rush. Stay here awhile and let your child really come to terms with this concept. It’s worth the time to build this base. 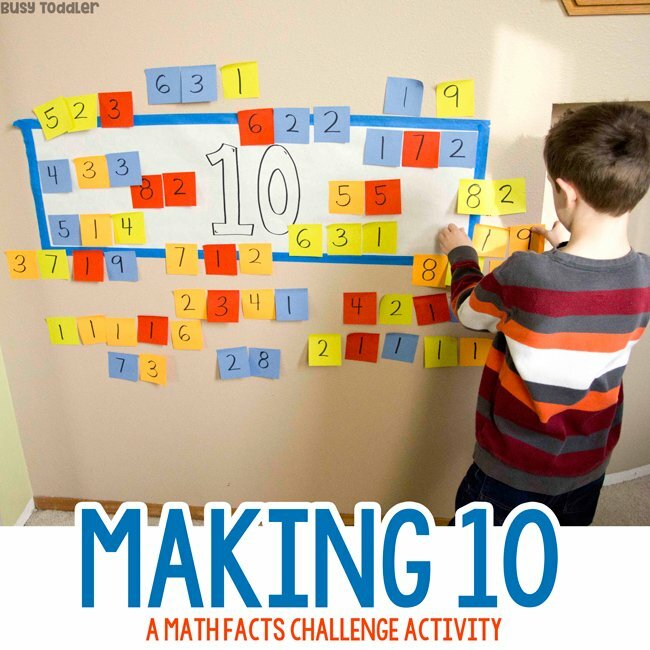 Is your child ready for Making 10?